You've just put in a new driveway and now it's time to get the grass growing and fast before there is any serious erosion.� Grading and excavation leaves the soil bare and if unprotected will wash away in the next heavy rain storm.� Learn how to keep the soil in place and give your seeds a good start in this article. The first step is be sure that your road contractor has properly graded for drainage. You may have installed a culvert near the main road access. This must be properly graded to ensure adequate drainage. A good contractor will carefully remove the existing top soil, perform the cuts and than replace the topsoil layer. Drainage culverts will prevent your new driveway from washing out.� The culverts can be ductile iron or corrugated metal. 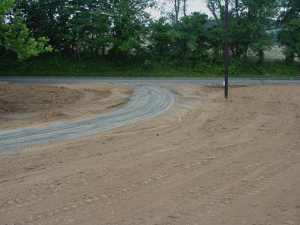 You'll need to dig the trench and lay the pipe.� This is usually backfilled with stone.� It's a lot of work and best contracted as part of the driveway installation.